Best Airfares to Republic of Moldova! The Republic of Moldova is a European country located in Eastern Europe. It is a landlocked country bordered by Romania and Ukraine. The country has varied terrain from rocky mountains to forests and lush valleys. The Immigration process in Moldova is quite simple. According to the Ministry of Foreign Affairs, there are 68 countries that do not require visas for entry into Moldova, and visitors can stay for a period of 90 days. There are 126 countries whose citizens need visas when entering Moldova. Citizens from China, Iran and Turkmenistan can stay without their visa in Moldova for 30 days. There are 4 types of visas for entry into Moldova - Type A, B, C and D. Type A visa is the Airport Transit Visa and Type B is Transit Visa. Type C is for short stays, most commonly for the purpose of tourism, sports activities and business. Type D is for Long Stays, such as for studying abroad, employment, entrepreneurship and other similar reasons in Moldova. You can download the visa application form from the official website of Ministry of Foreign Affairs of Moldova. Passengers older than 18 years old are allowed to bring without customs duty up to 200 individual cigarettes or 50 cigars or cigarillos, 2 liters of wines and or spirits, 5 liters of beer, perfume and other goods for personal use. Getting an Air Ticket was the Easiest Thing Ever! Even though we planned to visit Moldova during peak season, it was still easy to get an air ticket from Lufthansa. I purchased an air ticket from Washington to Chisinau. As soon as I got onto the plane all of us were pleasantly surprised by how welcoming the crew was. The airplane was one of their biggest models with state-of-the-art facilities. The seats were comfortable, the food was delicious and the flight attendants were very professional. All in all the services was exceptional! I enjoyed my flight and reached the destination on time. I'd definitely recommend everyone to purchase a ticket from Lufthansa and make it your permanent airline partner. It was a great way to start what would be a memorable vacation. Buying an air ticket to Moldova was a hassle-free process thanks to online booking. 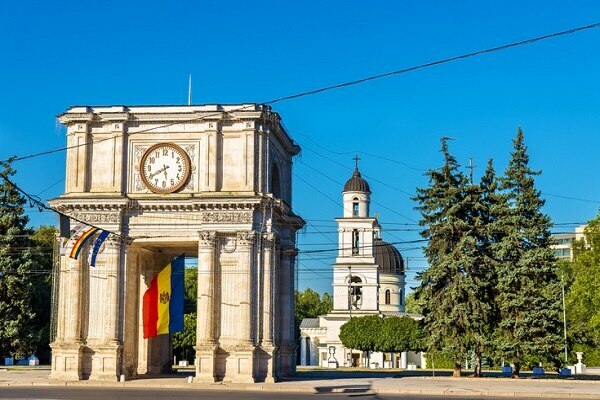 Depending on the route you take and your departure city, purchasing an air ticket to Moldova is almost unbelievably easy. Popular air routes are via Europe and U.S. If you want a cheap ticket to Moldova then try searching for flights on popular ticketing websites. If you are coming for vacation, then you should buy an air ticket for Chisinau - the capital city of Moldova. Many U.S. and Canadian airlines land in Moldova. Before choosing any airline, you might want to check with your travel agent whether or not a ticket is available. Be sure to keep your ticket safe as authorities demand your ticket every now and then. Got My Bus Ticket at a Very Short Notice! > Carefully read your ticket - is the bus going to Moldova? Q. What are the different ways of getting into Moldova? A. You can travel to Moldova by plane, car, train, bus, and boat. Many airlines fly to Moldova including Turkish Airline and Lufthansa Airline. Moldova has their own airline as well. There is only one international airport in Chisinau. Wizz Air offers the cheapest ticket to Chisinau. If you plan on entering Moldova by car, then there is a small road tax that you need to pay at the border. Daily trains from Romania and Ukraine help you in getting into Moldova in an inexpensive manner. The bus system here in Moldova is great as well. There are daily trains connecting Chisinau with many Romanian and Ukrainian cities. Generally, it takes 30 hours to travel from Moscow to Moldova. As Moldova is a landlocked country, there are not many water routes. However, there is a ferry service which connects Moldova to Istanbul. Q. What is Moldova most known for? A. Although Moldova is quite popular for its cultural and archaeological background, the country is best known for the wine that it produces. There are many large-scale wineries producing high-quality wine in Moldova. This wine is exported to the rest of the world. Home-made wine is quite popular as well. Moldova's wine industry is growing at a fast pace. The top wineries in Moldova include Milestii Mici Winery, Cricova Winery, Asconi Winery and Et Cetera Winery. If you plan on visiting any or all of these wineries do not forget to taste the amazing wine they make. Q. How good is Air Moldova? A. Air Moldova is an official airline of Moldova and is renowned for its amazing services. You can easily buy an air ticket for Air Moldova by visiting their official website. Their tickets are cheap and you can book your ticket online as well. While booking an air ticket you can look at loyalty programs. With the purchase of an air ticket from Air Moldova, you get gift vouchers as well. You cannot transfer your ticket to any other person. You can print your ticket sent to you via email by Air Moldova. The airline caters to groups and businesses buying a ticket. Airports handling direct flights to Chisinau International Airport • Munich Airport • Vienna International Airport • Dublin Airport • Sheremetyevo International Airport • Brussels Airport etc. There are many air routes to Moldova. The popular flight routes go through different states of the U.S. including New York, Chicago, Los Angeles, San Francisco, Dallas, Boston and Washington. Other popular air routes include those via Europe. Chisinau International Airport is Moldova's main international airport and is close to the center of Chisinau, the capital of Moldova. Chisinau International airport is home to the country's national airline, Air Moldova. There are also multiple small airports available for those who want to fly within the country.